Throughout Colorado there are numerous Texas Creeks. 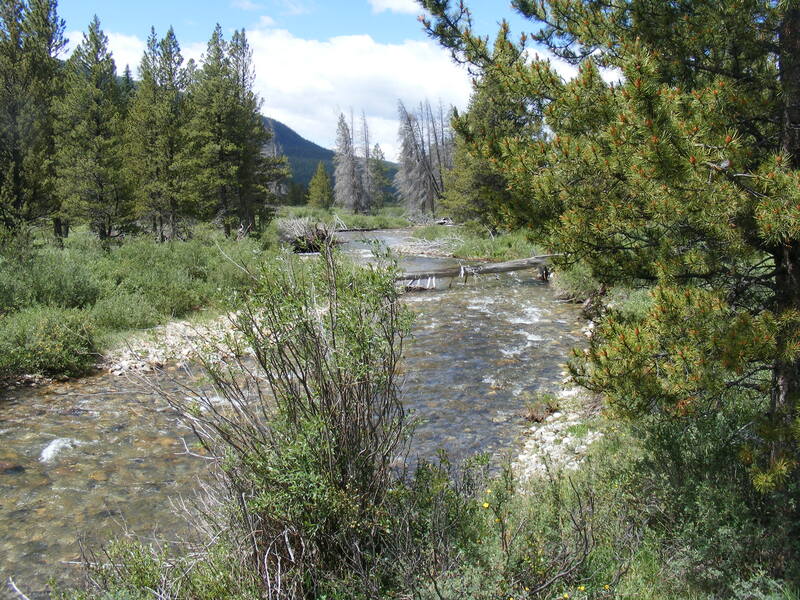 This creek that I am writing about is located on the western slope of the Sawatch Range and is just north of Cottonwood Pass. 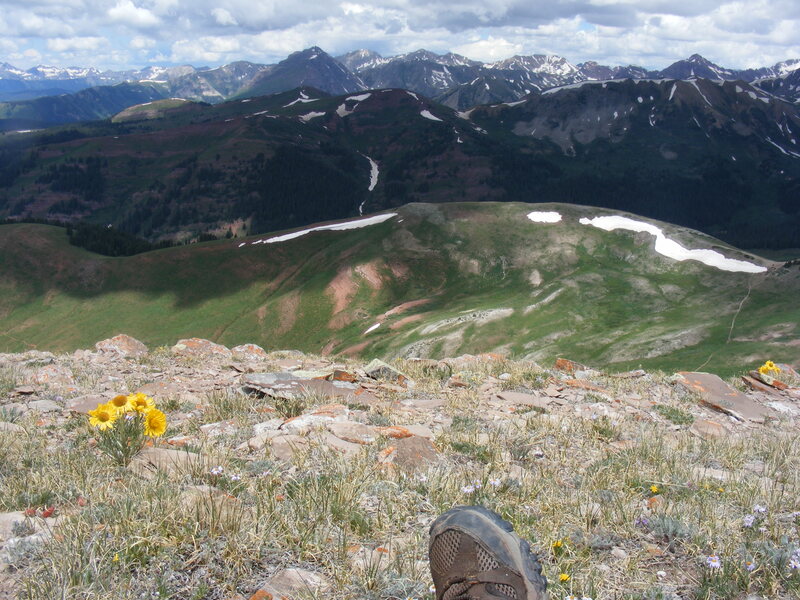 The Sawatch Range is a long ridge that runs from Salida to Leadville and is also the Continental Divide. Thus, Texas Creek terminates in these mountains and forms one of the headwaters of the Colorado River. I had driven up from Gunnison through Taylor Canyon and into Taylor Park. Taylor Park is a scenic mountain setting flanked on the east by the Sawatch Range, which majestic rocky summits rise up into lofty, snow-clad peaks. Unfortunately, this area is mostly used my loud, motorized recreationalists and is somewhat crowded during the high summer months. The Sawatch Range itself is mostly part of the Collegiate Peaks Wilderness, and that, a designated area of slow, quiet use, was where I was headed to. I parked on Gunnison National Forest Road 755 about a mile or two from the main road running through the area. From there, I walked the remaining four or five miles along the road to the wilderness boundary. The lingering clouds from the previous day were setting about low throughout the valley and made a scenic vista that brought joy to my heart. Despite the occasional passage of a group of motors, this area is peaceful and Texas Creek itself is broad and clear as it flows swiftly past on its way to the Pacific Ocean. This area is mostly sagebrush and lodgepole pine dominated landscape with their concomitant vegetation. At the wilderness boundary the vegetation has begun to include Douglas fir and other indicators of a wetter, lusher climate. By the time I had reached the wilderness boundary, I had only the strength to walk another mile and a half, to Waterloo Gulch. Looking upstream, the valley revealed its glaciated heritage by the obvious U-shaped profile. The valley here is broad and in it grows tall grass were the water gathers. I especially remember finding nice places along Texas Creek itself to sit and enjoy the quiet and grand scenery. The forests were fine to explore as well, but in the end I wish that more of this area had been set aside, preserved from industrial transformation. The combination of high mountains and sagebrush flats is a fine contrast, and wide Texas Creek could use a bit more quiet. By mid-July, the summer monsoon season had brought its clouds and rains. Nearly every day, the mountains get an afternoon shower, which is inconvenient for hikers but keeps the grass green, the forest lush and the flowers vibrant. When I look at this set of snapshots, I notice the clouds in every direction that produced shadows across the landscape and made photography difficult due to the contrasts produced. I love the documentation that I produced on this hike, but technically it could have been better. Doctor Park is a large meadow at the head of Trail and Big Gulches and is east of and adjacent to Manganese Mountain. East of the park is Gandy Gulch, and views from this perspective are also fine, but I didn’t see them this day. The Doctor Park Trail, officially known as Gunnison National Forest Trail #424, leads up from Taylor River and more or less follows Trail Gulch. The trailhead is located at the far end of the North Bank Campground and immediately leads up through a series of switchbacks until finally cresting a small ridge. 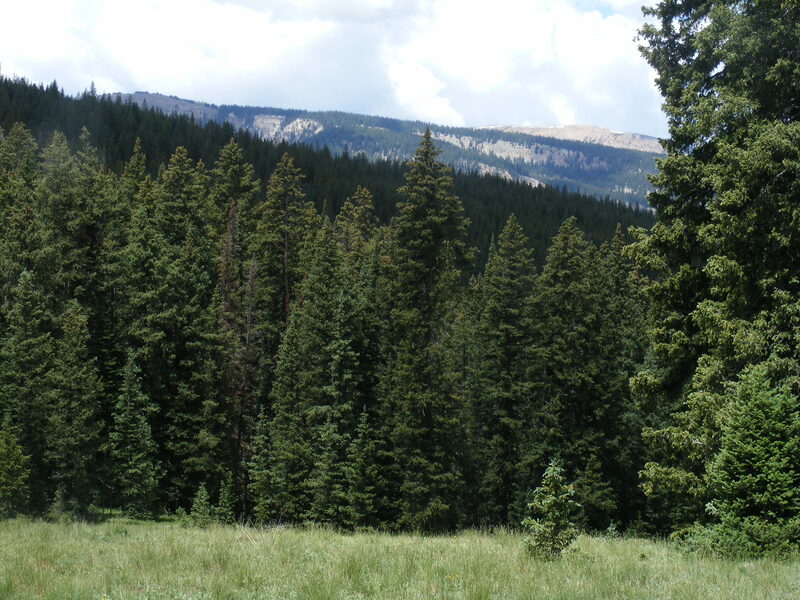 This area, lower in elevation and drier, is home to one of the uncommon groves of ponderosa pine found in the upper Gunnison basin. The rocks are composed of an reddish and orange-ish eroded granite and, heavily eroded by the passing eons of wind, rain and numerous freeze-thaw cycles, have a rounded and crumbly quality about them. From a distance the rocks look similar to eroded sandstone. This trail is heavily used by mechanized mountains bikers and is somewhat trying for pedestrians to use. I have to say that everyone, that is, the mountain bikers, that I met was friendly and more than happy to share the trail, but constantly having to move off the trail every ten minutes or so diminishes the equanimity that is obtained by hiking. But overall, I enjoy this trail and it is a fine hike; I thoroughly love the changing habitat from the river to mountain park, from the dry to the lush. Along the way are thick conifer forests, trickling water and large groves of aspen. Being on a south face, there are also blooming flowers here earlier than other places. Elk, deer, bear and other wildlife are also abundant. Strictly and “out and back” hike, I hiked up to the park and found a place away from the trail to relax and have a snack. Unfortunately, cattle had marred some of the meadow and there was, in every appealing location for sitting under a tree, feces strewn about with abandon. What truly galls me is that my taxes are paying for this subsidized destruction of the public domain. If I were to avoid this hike in the future it would be due to the cattle and not the faster-paced bicyclists. Overall, though, it was a fine, green day to be out in the woods. The shepherds were with me and for them the best part was upon our return to the trailhead they were able to take a dip in the clear and cool Taylor River. For the past ten years I had been driving up to Crested Butte from Gunnison along the state highway past the turnoff for Cement Creek. During the decade hence I had made only the most cursory exploration of the upper headwaters of this creek. Thus, I decided that on this fine day I would explore the region upstream that I had yet to see and would add to my knowledge of local topography. I had previously used the Deadman Gulch Trailhead to explore Reno Ridge so I drove up to that point and left my car to begin walking along Cement Creek upstream from that point. This area receives heavy motorized and mechanized use and perhaps that is the reason I had never before seen it. I was pleasantly surprised to find a lush green valley surrounded by the ubiquitous red, striated rocks that form most of the Elk Mountains. My intent had been to simply hike along the creek bottom for a few miles before returning. However, I soon spied a large hill that I thought would make a good perch to gain a better perspective from. With each elevation gained that perspective improved and before too long I had climbed over two thousand feet to the summit of Hunters Hill. From here I gained a fine understanding of this portion of the Elk Mountains. The sundry peaks, still clad with streaks of snow in mid-July, were like so many set rubies, an endless parade of soaring, refulgent elegance clad in velveteen verdure. My heart soared with the hawks from valley to valley while my body remained stationed on the rocky eminence. With map in hand, I dutifully and patiently identified as many of the nearby peaks and other topographic features as I could and traced the various waterways along their tortuous course. All of nature’s bounty was observed and appreciated, from the rock itself to the many yellow discs of the alpine sunflowers that thrive at these high elevations. Of course, no part was as magnificent by itself as when it was combined with all other aspects of the natural setting and the sum of the whole is so much greater than the individual components stripped from their setting. I could have lingered, staring at the view, but eventually the clouds that had been passing by began to coalesce into a larger and darker cloud that threatened to send spears of electricity into the atmosphere and down upon the unwary. Like all high peaks, this one is exposed to the elements and the best thing to do when lightening threatens is to retreat to a lower elevation and find adequate shelter. So, that is what I did, more or less retracing my steps that way I had come. The tricky and deceptive part of judging the clouds is determining when one is safe or not. In the end, there wasn’t any lightening from the clouds that I had thought would send forth their emissions but I was happy to find shelter from the rain. Hunters Hill lies at an elevation of twelve thousand, six hundred feet; not one of the highest or most noteworthy peaks, but still a fine climb in a gorgeous setting. There is a reason that so many people visit and explore this area on their dirt bikes and ATV’s. I do prefer quiet recreation, but despite the motorized use and concomitant noise, I didn’t feel oppressed. In fact, everyone was respectful of one another in pursuing the recreational activity of their choice. Hiking along the main road itself for the initial and last mile was a bit crowded, but even then their were numerous friendly waves from one group to the other. There is so much to see and explore in this vast basin that is the upper Gunnison River that it doesn’t surprise me that I had taken a full decade to venture back into the upper reaches of Cement Creek. Now that I know what I have been missing, I shan’t be so remiss again and look forward to my next adventure in the vicinity. More alpine sunflowers on Hunters Hill. I guess in the end I didn’t have the equanimity on this backpack that I should perhaps had. The lack of stove prevented me from having hot food and dear, precious hot coffee in the morning. That meant only that I had to each my Vienna sausages cold. I had planned also to make the four passes loop in three nights but had found the first pass to be still snowbound this first week of July; at least enough so that I wasn’t comfortable making a solo descent. 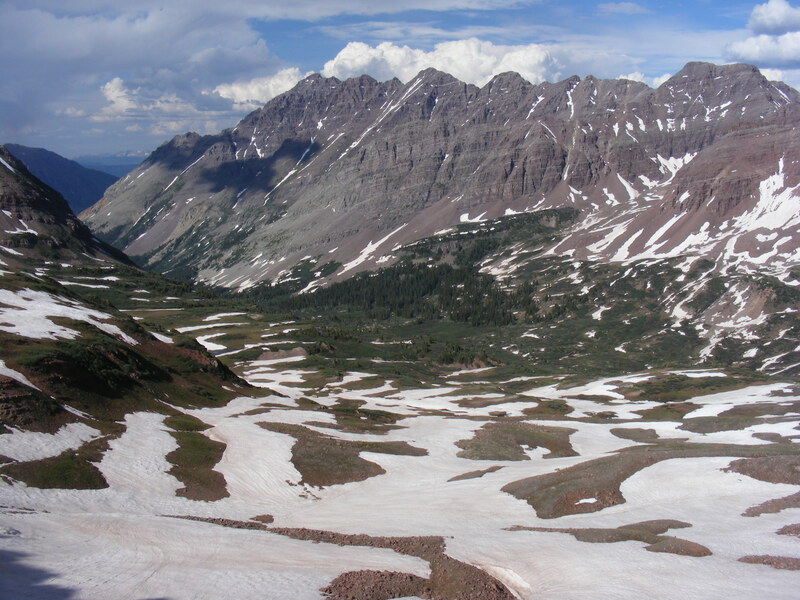 Instead, I camped on a small knoll below the west side of West Maroon Pass and about a mile and a half distant. I sure loved the high elevation and thin atmosphere. The lush growth is a natural marvel to behold and I was privileged to see nature in all her splendor. But, due to my proximity to tree line, I decided against having a fire in this heavily visited drainage. Perhaps I should have descended another thousand feet or so to a thicker forest with an abundance of forest floor litter that wouldn’t be missed for a small campfire. So, after two nights of cold solitude in this drainage, I decided to make my way back to town and find a hot breakfast and its concomitant molten coffee. Of course, looking around at the time, and especially now temporally removed and serene in my domestic comforts, I realized that my mild physical discomforts were a small price to pay for lodging myself in the abundantly verdant abode resplendently situated among the red, striated cliffs visible were the verdure wasn’t. Refulgent snow, clinging to nooks and swales were not yet the sun’s warmth had fully spread its golden veil. Well, I shall have to make another visit, and trek into sublime glory at a future date. This drainage never fails to uplift a spirit with its vast store of lush, abundant vegetation. The mundane and perfunctory chore of packing camp was swiftly completed soon after I arose. I took a last look around and winded my way through the thick willow before finding the trail that would take me back to my conveyance home. Usually, this would be the East Fork trailhead along Schofield Pass Road but due to the snow-pack atop the pass, most vehicles parked on the south side a couple of miles away. On my hike out, I stopped to take a closer look at the magnificence blooms of the monument plant and found inspiration and immaculate design. I sit now at home in late March, as the temperatures slowly rise and the snow melts and the rivers are swollen from bank to bank with chugging, cloudy water. The days are getting longer yet patience for summer in the mountains is the best and only consul to be had; but I know that something wonderful is waiting for me! I had placed camp at about eleven and a half thousand feet in elevation. A fine place to catch the morning’s first gleaming. After my arduous day of hiking the previous day I was in no hurry to rise out of bed and luxuriantly lay about sleeping, sporadically peering out at the increasing light and enjoying the snug comfort of my sleeping bad, until the sun rose and lit up my tent and I finally mustered enough energy to rise and partake the day. The atmosphere was heavy with moisture from the melting snow and occasional rains as I breathed in the thin air of the high mountains, air that invigorated and awakened me upon each draft. Since I wasn’t going to make my plans, the four passes loop, happen this time around, I went with my backup plan which was to explore the nearby area and see the vantages from some of the high points around me. First off, I hiked back through the scrubby willow to the trail. The willow seem like they out to let passage by easily, being only about two to four feet in height and any hiker can see over them to where he or she would like to go. Yet, they entangle and snarl any attempt to make transit from one point to another. At the trail, I hiked back up to West Maroon Pass and found to my surprise a group of four backpackers making their way up the east side of the pass. They were better prepared than I and more familiar with this area, so I deduced after chatting with them. This group ended up climbing up the ridge south of the pass, no easy feat even for the unencumbered yet they were carrying full packs. This is a solid class three climb and judging from the rocks tumbling down not to be trifled with. An amazing feat to behold. I found some marmots out and about and sat watching their activity while watching the progress of the intrepid foursome. All around at this high pass was the red rock from the eroded ancestral Rocky Mountains that had been uplifted into place after these tens of millions of years. Despite my own reluctance to pursue the course of the foursome now heading upwards, I did learn from them and now have ideas and ideals to pursue in the future. There were many people out and about; most of them made the same decision that I did and chose not to descend the snowy slope on the east side of the pass. One couple had camped just beneath the pass near the trail and up against a large snow pack that gave a good idea of the magnitude of snowfall here. They reported that the marmots were an ever present nuiscence, constantly raiding thier tent. Well, marmots need to eat and woe to them that choose to place thier tent were marmots are busy. I was then glad that I had made camp off some distance, away from the trail and away from large, foraging rodents. After surveying the scene at West Maroon Pass, I took the trail over to Frigid Air Pass and found that pass to be clogged with snow, also. Yet, some other intrepid soul had made passage; next time, I shall have to bring an ice ax and crampons. The views were amazing; all green and red and white and blue. The Elk Mountains may have inspired John Denver to write “Rocky Mountain High”, and I can see why. These mountains are impressive by any scale of the imagination and my limited imagination can barely put words together to describe my feelings of elation while among them. From Frigid Air Pass, I walked over to Hasley Pass and gazed into the hanging valley that drains the north side of that pass. There were cheerful yellow Old-Man-of-the-Mountains blooming their yellow radiance as the sun strove to keep them refulgent. Hagerman and Snowmass Peaks rose up from the creek bottoms, a solid wall of rock streaked with patches of white snow at the high elevations and green vegetation at the low. The sound of water was everywhere: gurgling, trickling, pouring, frothing – all of those adjetives can only hint at the sound of the liquid motion. From Halsey Pass, I descended to the West Maroon Trail and then slowly made my way back to camp. The clouds made their way by, and some moisture was precipitated upon the land but I was happy, exposed as I was, to not encounter the electrical accompaniment of the heavens. As dusk descended, I climbed up a “small” knoll; I say “small” because before I had realized it, I had climbed some seven hundred and fifty feet above my camp site. 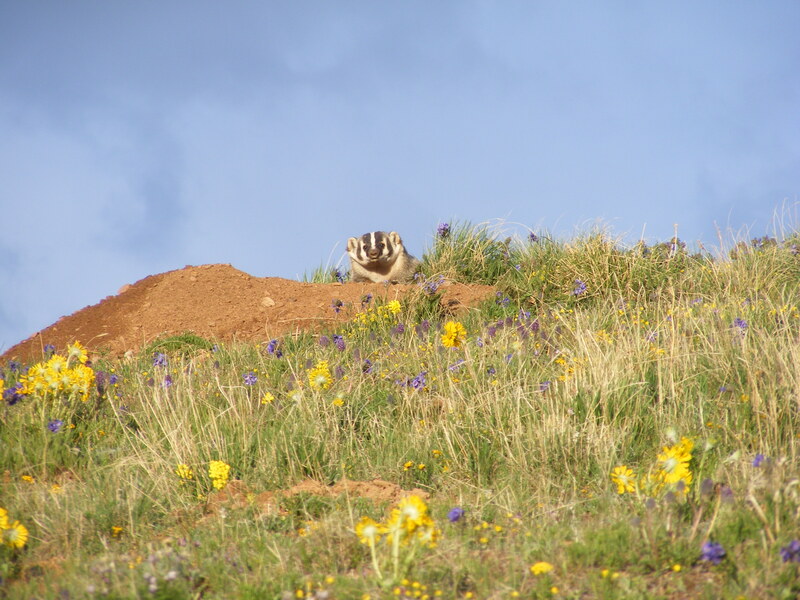 I encountered a badger, busy excavating a den. I couldn’t say if this was predatory behavior on an extant den of some smaller rodent, say; or, perhaps this was a den for personal use. Not wanting to interrupt further the activity of this engaged mustelid, I moved off a quarter of a mile and watched the final rays of the setting sun from the west strike and light the same wall of rock it had the previous night. Finally, after slowly making my way back to camp as the light faded into final darkness of the early summer, I found my sleeping bag and slept the sleep of the weary and satiated. 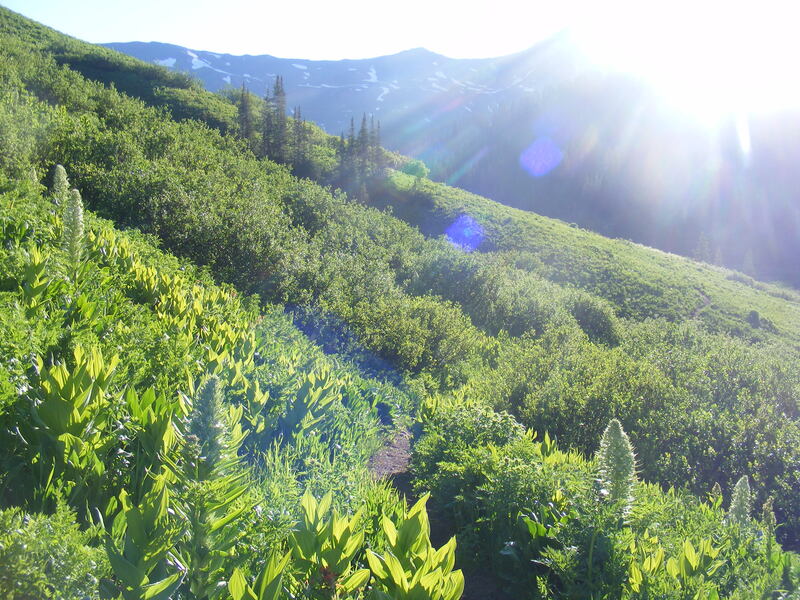 My intent for this hike had been to backpack the four passes loop in the Maroon Bells – Snowmass Wilderness. However, I had thought that the passes would be clear by the first week in July – how wrong was I. My first hint that all was not right with my plans was that when I attempted to drive over Schofield Pass and found it also clogged with snow; some hardy souls were driving over the solid snow pack, but I wasn’t going to attempt it as the consequences of any change in the snow could have been disastrous. So, I parked further down the road by about two miles and hiked my way up and over Schofield Pass and to the trailhead of the West Maroon Pass Trail, also known as Trail 1970. Although there was still significant snow heaped up here and there, most of it had already melted off leaving green meadows to flourish with summer’s arrival. The East Fork gets signifcant snowfall during the winter and also generally is wet during summer. The result is a wildflower spectacular, although I was early by a week or two to see the main efflorescence. There were some monument plants that had begun to bloom, but for the most part the plants were just growing and had yet to burst forth in color. As I ascended the trail, it became obvious that this high country still had much time to dry out. The trail near the summit of the pass was a muddy quagmire and my feet became sopping wet trudging through the muck. I did make it to the summit of West Maroon Pass but one look over to the shady eastern aspect made me decide that I didn’t want to attempt to descend sans an ice ax and crampons, neither of which I had brought. So, I decided to make camp on a dry and level patch of ground about a mile and a half from the pass. This combination wasn’t easy to find since that land here isn’t know for being level in the first place and most such locations had standing water. But I persavered and found a find and scenic place to rest my weary bones. To get to the location I had chosen for camp, I had to bushwhack through thick stands of willow and over the swollen creeks. Once camp was set up I made a separate cooking area about a half a mile away; I then realized that I had forgotten to bring my camp stove, so I would have no hot food or beverages for the duration. What a boneheaded move. Yet, here I was, in this scenic location surrounded by mountains made from the uplifted red rock of the ancestral Rocky Mountains. The mountains were still dabbled with patches of white snow and what wasn’t snow was coated in the rich green of new growth that promised another healthy crop of spectacular wildflowers. The sky was variable between clear patches of blue sky and dark thunderclouds that promised to bring more moisture to the area. So, as I ate my cold supper, I was pleased that the sun found a way to strike golden, rosy and orange shafts of light against the head wall of the East Fork drainage. It was a fine sight and made me glad that, despite my poorly laid plans and lack of packing etiquette, I was here in this awe inspiring setting. This morning, that of my forty-fourth birthday, found me waking up in my tent which had been pitched on the edge of a large meadow adjacent to Rock Springs at the upper end of the Coal Creek watershed. The sun was near shining when I emerged from the tent, exceedingly refreshed after my previous night’s communion with the stars over a mildly blazing campfire. There was one important goal that I wanted to accomplish today that would act as my birthday present to myself: my self appointed task was to hike to the summit of Bonfisk Peak, the high point in the ridge that divides West Elk and Soap Creeks. I had tried in vain to reach this point a number of times but had been rebuffed and turned back for a number of reasons. This attempt I was sure that due to my relatively late start that I would get turned back by the gathering clouds and the resultant lightening that was sure to impede my quest. Bonfisk Peak lies approximately four miles north of Rock Springs so I needed to safely be able to hike eight miles before any electrical storms gathered in my vicinity. 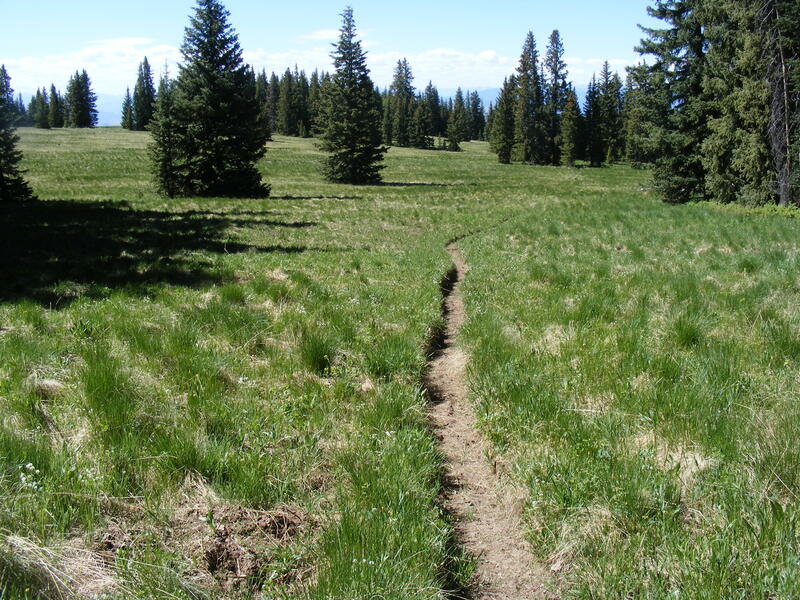 Initially, the trial passes above Rock Springs and gains elevation through a dense sub-alpine forest before emerging on a large, shallow-sloped mesa that has a more sparse forest and is interspersed with large meadows; the view to the south encompassed most of the northern San Juan Mountains, refulgent in the bright sun that glistened off the snowy north face. After a couple of miles the trail emerges on a ledge that allowed me to view a stunning and sublime view of West Elk Creek; massive cliffs of breccia and deep, steeply cut gullies gave evidence of the rough topography of the region. Along the way there is a memorial erected to one who passionately loved these mountains – I can commiserate with both the lost one and those who helped celebrate his life; especially now in the bright green early summer when all was glorious. As I continued the broad mesa narrowed to a ridge. Although the majority of the aspect lies to the south, there were a few sections of trail that pass through northern faces and consequently were still shrouded in occasional drifts of deep and wet snow that resisted bearing weight. I had not counted on snow being present, and it was almost enough to turn me back when combined with fallen trunks of old snags. Dauntlessly I persevered and as I was keeping track of my progress on my topographic map I suddenly realized that with one more ascent I would be in view of the termination of my quest. Bonfisk Peak turns out to be the last remnant of basalt that previously capped the entire ridge and mesa and has since eroded off after being deposited. This same basalt is widespread and I have encountered it throughout my explorations of the southern face of the West Elk Mountains. But, geologically speaking, the tiny piece will be gone in a flash. We humans tend to think that what we see is eternal but little do most realize that geology proceeds, with a few spectacular and infamous exceptions, at a pace slower than human perception. From here, I could see into Big Soap Park and down into the deep recesses of West Elk Creek; almost the entire drainage from the slopes of West Elk Peak to Blue Mesa Reservoir are visible. I took quite a bit of time, although I couldn’t give an estimate on the exact amount, just sitting and imbibing the essence of the mountains. The freshly green trees and grasses were at the height of verdure and after a snowy winter this view made me feel as if I had been transported to another world such is the difference between the two seasons. After so many efforts and attempts to reach this summit I was gratified to have seen the view from this eminence. From my perch I consulted my map and was able to differentiate the sundry drainages and corresponding high points. I made note of all that I saw and whether or not I was personally familiar with what I visually observed. After much thought, study and contemplation I was ready to make my way back to camp and pack my gear and make the final trek to the trailhead. The rest of the hike was without incident and I placidly enjoyed the return glide down to camp and all the views that presented themselves to me. The Rocky Mountains are still a challenge at the changing of June into July; water is swift and deep, snow is still accumulated in amounts that can make passage a challenge. The reward for those willing to get out a bit early is the intense green of the vegetation and fine character of the rare air and salubrious atmosphere. The bright whites of passing cumulus clouds and lingering snow contrast with the green grass and blue sky and all combines into a sublime beauty that I have trouble putting into any combination of words that can possibly describe the repeated scenes of majesty. I am living a charmed live that I can experience this part of the world at this time. Camp was packed quickly but not in haste and soon the shepherds and I were making our way down Coal Creek to the pass that would lead us over to Cow Creek and back, eventually, to the Soap Creek trailhead. It was still a bit early for the high sub-alpine and alpine flowers to be in bloom, but once we descended some thousand or so feet the flowers were in bloom and the hike was enlivened by the bright and profuse displays of fresh sunflowers and their cheerful yellow efflorescence. Continuing our descent from the pass led us past the same points we had seen the previous day but this time the hiking was a bit easier and not quite so hot. Soon, we passed along directly adjacent to Cow Creek and after the last mile of hiking and appreciation of the carved geology in this locale we passed over the Soap Creek Bridge and re-entered the world of civilization.